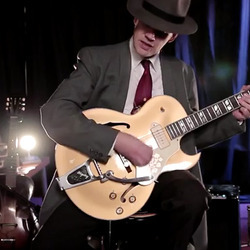 musicians and Anth Purdy’s Swing Jazz Guitar captures the sounds and styles to bring this wonderful music back to life. All original material, my collection includes guitar instrumentals in the styles ranging from Swing, Western Swing, Gypsy Jazz and the sounds of the 50’s. I have been influenced by early guitar greats as Les Paul, Charlie Christian, T Bone Walker, Django Rienhardt and Hank Garland to name a few. A unique act with its roots in the early guitar greats. JamMan Stereo "The JamMan has a great natural sound even at high volume, is very easy to use in a live situation."